As someone growing less and less interested in the overcrowded superhero movie market, specifically Fox’s X-Men movies, I was skeptical of Logan and all the buzz it was getting. However, against my better judgement, I went to see it just the same. After all, it is the last time we’ll see Hugh Jackman playing the part he’s played in nine films dating back to 2000’s first X-Men film. And for the most part the buzz was well earned. It’s a film set in the future that plays like a slow burn western (even directly referencing George Steven’s 1953 film Shane) as an aging Logan and Professor Xavier transport a young mutant girl while being pursued by endless amounts of armed thugs. They’re lead by Transigen’s head of security Donald Pierce (Boyd Holbrook). He and a few of his comrades are cybernetically advanced, though not mutants themselves. Transigen is a shady company that, we learn, may or may not have been involved in experiments using children to create mutant super soldiers. As you can tell by the trailer, Laura (Dafne Keen) - the little girl mutant - is a Wolverine-type of mutant capable to handling herself in most combat situations, even ones that pit her against squads of well-trained Transigen security officers with guns. While Logan initially tries to reject the offer to get involved with her, he soon comes to sympathize with her due to how similar her story is to his own. The film borrows from Watchmen in that it briefly asks Wolverine to contend with the legend behind his name and past exploits. Laura is an X-Men comic book fan, and Logan is continually faced with the fact that he can’t, nor has any desire to, live up to the storied “hero” the world has portrayed him to be. 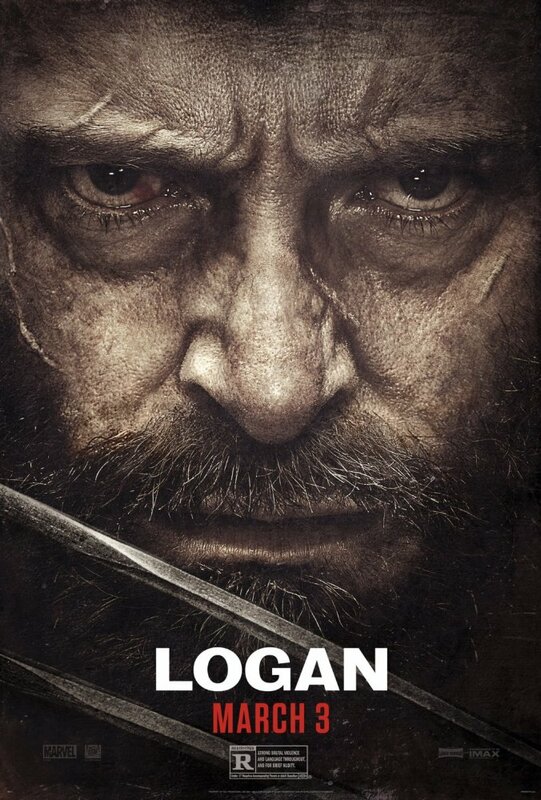 Complicating matters is the fact that Logan is struggling with an illness that seems to hinder his mutant ability to quickly regenerate his health and fight with the youthful intensity he’s known for. It grants him a vulnerability that he hasn't had in any of the past films. However, you wouldn’t want to know much more than this heading into the film, so I’ll leave the description at that. The future world here feels lived in, but not futuristic. It’s not a sci-fi future, it’s one that looks like a realistic glimpse of the not too distant future. In fact, if you didn’t know it was the future, you’d think it were modern day. Writer and director James Mangold avoids over explaining a lot of the details here. It’s very clear that it happens well after the events of X-Men: The Last Stand, but how things came to where this film begins is less clear. Mangold lets the film play like a comic book version of Midnight Special, or Terminator 2: Judgment Day. There’s even a hint of 3:10 to Yuma, which Mangold also directed. He begins this “on-the-run” drama with characters somewhere in the midst of their troubles and lets the details slowly reveal largely through character interactions rather than heavy-handed flashbacks. His subtlety in both the storytelling and the visual style is a breath of fresh air for a genre of films dominated by CGI effects and finales that involve giant battles to save the world. Instead, Logan is concerned with more human and relatable stakes. This being the only R-rated X-men film, fans finally got the dark, visceral, super violent Wolverine film they’ve wanted since the beginning. There’s a lot of blood and severed limbs as both Wolverine and Laura use their ultra-sharp adamantium claws to hack and slash their way out of danger. And because the fighting is up close and personal, the way Mangold shoots it remains close as well. However, it never becomes over-the-top and incoherent the way some other hero films can. There aren’t magical, nonsensical powers or fast editing to confuse things here. And though it’s a slow burn, character driven film, it should be noted that this film is a terrific action film. Fans of the superhero genre won’t be disappointed, and neither will fans of engaging action films. Yes, it relies on a bit of knowledge of past X-Men films, but not so much so that you’d be missing something if this was your first X-Men film in years. It’s a rare character driven film for a franchise that has grown too big and tried to utilize too many characters to make films this good. X-Men: Apocalypse was something of an overblown disaster. This feels like a big change of mentality for Fox, and I can’t help but wonder if other filmmakers are taking notes. It looks different, it feels different, and it plays so much better than other recent hero films across the board. Just as importantly, it’s a fitting end to the larger Wolverine cinematic storyline, and Jackman couldn’t have ended on a higher note.